When I was at PAX South, I visited Mercury Learning Books. They publish all sorts of books about game design, and I got the opportunity to review a couple of them. So here we’ll take a look at three books I got. The first is Classic Game Design, which teaches you how to make examples of popular early arcade games. 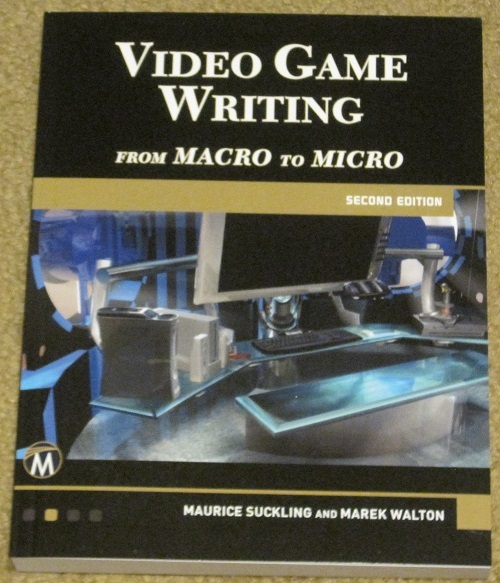 The second book is Video Game Writing, which explains what to expect if you go into that field. The third book is a treat, as I had my dad, Randy Woodham, review it here! 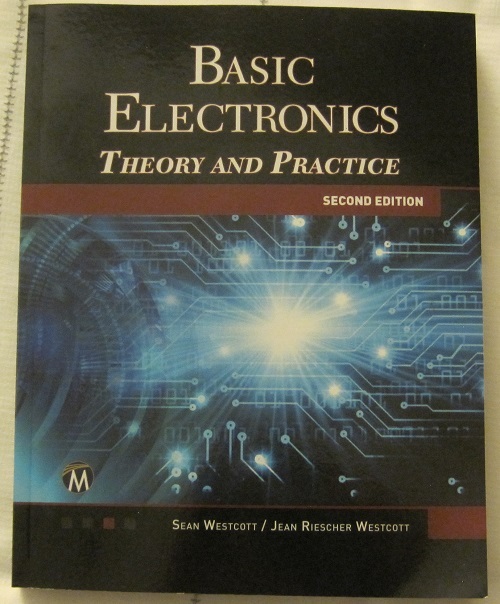 It’s Basic Electronics: Theory and Practice! So let’s dive in and take a look at each book! 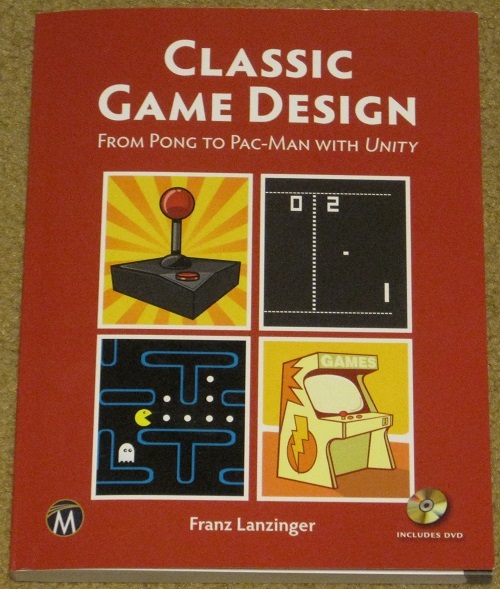 Classic Game Design: From Pong to Pac-Man With Unity. 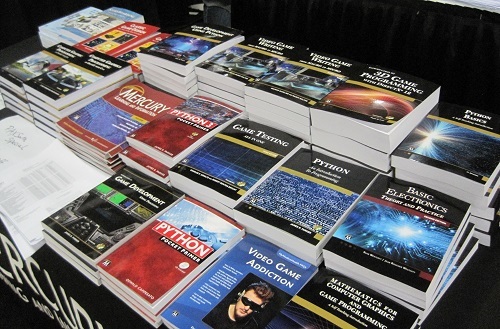 When I visited Mercury Learning Books at PAX South, I was intimidated by all the books they had. I love video games, but I’d rather play them, not make them. So I was a bit skittish at first when the lady at the booth offered the chance for me to review a couple. Here is a picture of the Mercury Learning booth so you have an idea of some of the books they publish. But the lady at the booth must’ve been psychic, because she picked out the perfect book to hook me into reviewing them, because it had a picture of Pac-Man on it! Classic Game Design: From Pong to Pac-Man With Unity, teaches you how to make versions of classic arcade games using programs you can download for free. The book was written by Franz Lanzinger, who helped make the classic arcade game Crystal Castles. Back in my Dallas Morning News days, I also reviewed a later game he made called Gubble, which plays a lot like Crystal Castles. Anyway, here’s a picture of the book. The only problem I had with this book is that while they say you don’t need to know anything about coding and programming to use it, I think I’d prefer to have some prior knowledge of those programs, just for my own sake. For instance, if I made a mistake in the code I just copied from the book, how I would I know where to look for the error? Also I don’t know how much room for creativity they give you in this book when coding. I was also worried that this book might become outdated soon, but after talking with some folks more familiar with programming, they said it wouldn’t be outdated for a very long while, if ever. But even so, if I didn’t have a full time job and needed to sleep, I’d definitely try and make the games found in this book. I think I could do it! So if you’ve ever wanted to dabble in creating your own classic games, this book is a good place to start. The next book I reviewed features more of my talents: writing. So I figured it would be a good fit for me to try out. Here’s a picture of the front of the book. This book really reads more like a college textbook. It even has assignment ideas and class project suggestions after each chapter. So if you are a college professor teaching game design, you should definitely look at this book, too. The book gives a brief history of stories in games, and explains what game writers do. There are chapters on NDAs and contracts, outlines, character documents, scriptwriting, editing, and more. I found this book a little harder to read, as it has less practical applications than the first book, plus the text is smaller (I did like the cartoons scattered every so often, though). 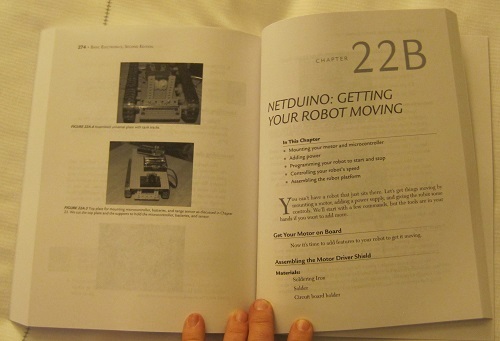 This book is prone to being outdated faster, as I’m already reviewing the second edition. Also I didn’t see any chapters on video game journalism or PR. I’m still going to keep this book as a reference tool, though, as it has examples of NDAs and contracts in case I ever expand my writing to other fields. And one problem I had with both books is that they are a bit pricey, but I think they’re considered to be more like educational college textbooks so that may be why. So anyway, here’s a short review of that book by my dad. I’m glad he got to review it, because even though I knew he is very smart, I had no idea my dad is such a good writer, too! I have a degree in electrical engineering and have worked with electricity for many years. While I still have a working knowledge, I have always found it difficult to explain the many complex concepts of electronics to a non-technical person. Therefore, I was very pleased with how Sean Wescott and Jean Riescher Westcott were able to present and explain basic electronics so clearly and thoroughly in layman’s terms. It is really brilliant how they laid out the various components of the subject without needing to use advanced mathematics to back up these explanations. The many practical exercises and projects that are included build on these basic explanations and make the whole subject really fun. For example, in chapter 13 the authors supply step by step instructions and other resources to build a direct current variable power supply. This power supply was then used to help launch more advance projects including a couple of different robot models that really work. That Classic Game Design book peaks my interest. I wouldn’t mind making a variation on a vertically scrolling shooter like RiverRaid. wow, a lot of these look great!